Palace Purple Heuchera is a hardy variety. Pink tinged white flowers of Palace Purple Heuchera. Heuchera or Coral Bells as it’s commonly called has become one of my favorite plants because of three traits. The leaf comes in many colors. As the day goes on a single leaf color is highlighted by change in the sun’s position. Leaf shape varies with the hybrid. The plant is easy to grow. When I first began to plant Heuchera there were two kinds available at the local stores. One was small with green leaves. Its little bell shaped flowers are the coral color that gives the plant its nick name – Coral Bells. The other was large with dark purple leaves. I planted them both. The one that has been the hardiest is called Palace Purple. 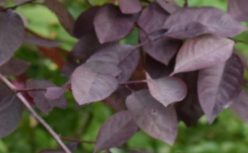 One leaf can be dark green with purplish edges. Depending on the amount of sunlight a leaf may be all purple. I have been able to transplant some of its offshoots to other places in the garden. As long as it is shady it grows. Even when I think I’ve dug up the whole plant, I’ll find a part left behind that’s still growing. Grows best in Zones 3-8. Native to western United States. Height varies from from one to one and a half feet. Width is generally one foot. Heuchera grows from a root. The middle of the plant mounds a bit. It covers the ground effectively and blocks out weeds. As the leaves spread out the stem touching the ground can take root and form a new plant. This plant is known for its leaf shape and color. Leaf shapes are flat to ruffled. A leaf comes in colors from green to orange to red to purple. It is often mottled. Each leaf can have two shades of color on top and a third shade on its bottom side. The color changes slightly as the growing season continues. Flowers are very small but pretty on long stems blooming in late spring to early summer. Some might bloom later. Depending on the plant the colors are pink, coral or cream. Cut flowers and use them much like Baby’s Breath in a bouquet. Plant in part to mostly shade in an area that is well drained. For most a drier location is preferable to a wet one. Watering is average. However hot days will dry it out faster because of shallow roots. Fertilize in fall with compost. Other plants that grow well in the same location with Heuchera are Fern, Astilbe and Tiarella. 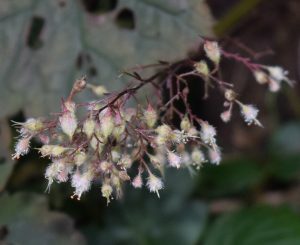 Some Heucheras have been bred with Tiarellas becoming plants called Heucherella. The main drawback: shallow roots. Root tops tend to heave in winter which means the they will come out of the ground. When the roots pop out they’re exposed to cold, dry air causing the plant to die. The remedy is to push the roots back into the ground. Add soil around them and press firmly. Try to prevent heaving by covering roots with mulch in the fall. 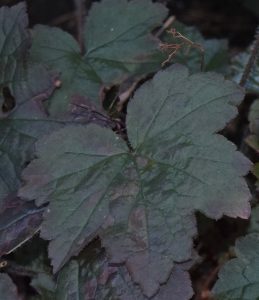 In winter Heuchera almost disappears. Mid-spring its colorful leaves reappear. That’s as exciting as seeing blooming flowers.